No, it's never just art. 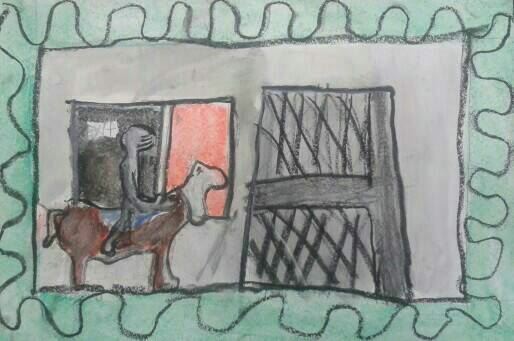 I am never, ever just teaching art. Art is the nexus of all things. This morning my 6th graders were introduced to Ancient Greek art and architecture. In this one lesson, we learned so much! We traveled in time, stopping to discuss why our timelines say BCE and CE instead of BC and AD. We noted how artistic time periods and cultures overlap and influence each other. We located Greece on the globe noting its proximity to Italy (which they know so well after years of Italian class). We observed and drew a diagram of an Ancient Greek temple, labeling stylobate, columns, entablature, and pediment for some architectural vocabulary and to note their symmetry and engineering purpose. We looked at the Parthenon and figured out why it looks so broken down now (through years of weathering, tectonic activity, and pillaging as other cultures moved across the Greek landscape over 2500 years). We recalled other buildings in our city of Philadelphia and around our nation that look like the Parthenon and discussed how the Greeks invented democracy and how we emulate that spirit through our civic architecture. We drew, compared and contrasted changing styles of columns through Doric, Ionic, and Corinthian periods and talked some more about how they were constructed like strung beads to allow for flexibility (good engineering for an earthquake prone place). We looked at and drew an amphora and figured out that no, the Greeks didn't invent basketball, but they did throw a discus in the original Olympic games. Finally students vied for their assignment of an ancient Greek god or goddess to research based on their interest- "Who is interested in music and the sun? ME! ME!- you'll research Apollo" and "Who is interested in love and beauty? ME! ME! -then you'll research Aphrodite" and 20 more kids got their own myth down the list. And in one hour we learned history, geography, vocabulary, math, earth science, civics, athletics, critical thinking, and....... art. And even managed to connect the 2500 year old artifacts to my students' everyday experiences and created an opportunity for choice. Possibly when they went home this afternoon, their parents asked "What did you do at school today?". I'm sure many of them said.... "NOTHING" (because that's what teenagers say). But really our kids do so much all day long! And teachers do even more to plan and prepare and engage and manage and inspire and encourage and correct. I have moments in my day when I wish SOMEONE could see all of these amazing things we teachers and students do together. Of course, by SOMEONE I mean our society, and leaders, and all the people who make decisions that can make it easier or harder to do what we do in the classroom every day. I am going to miss this class so much! Out of 80 students, about 10 of them applied for CAPA and 7 of them got accepted and will be pursuing the arts in high school. But even the other 90% of this class were engaged and open to exploring their creativity. 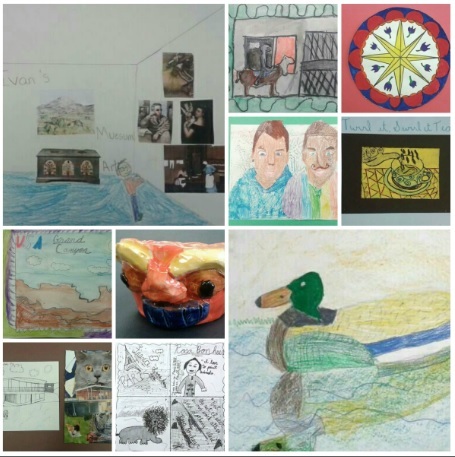 Our 8th grade curriculum explores the art world from Abstract Expressionism up to Contemporary art practices. As the culminating year of art, I expect these students to use their previous knowledge and experiences in art to help them create work that is expressive, personally meaningful, and communicative. I offer my 8th graders much more freedom to use the studio space and tools as best suits the work they are trying to create, and I keep projects more open-ended to create multiple avenues of artistic exploration. 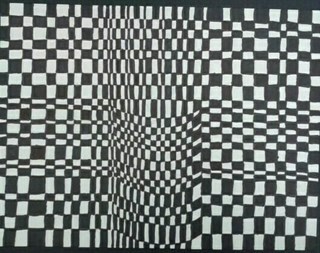 An early project in the year was Op art. 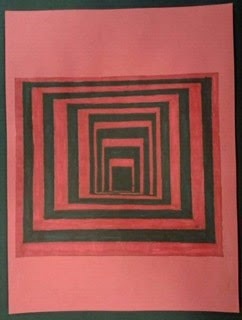 Students looked at work by Vincent Vasarely, Bridget Riley, and Edna Andrade and analyzed their various approaches to creating optical illusions. We talked about how the brain perceives color and how easily tricked it is, and how to achieve illusionary effects through repetition, contrast, and proportion. After demonstrating a few techniques, students selected one or more to pursue. 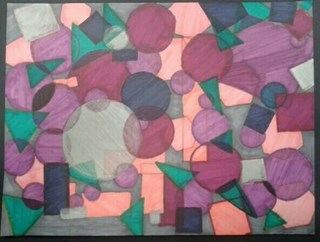 Some students wished to reproduce existing illusions, while others tried to combine effects into a single composition. This is absolutely a lesson I would continue to use in the future, both for its effectiveness at teaching or reviewing art elements and principles and for the high level of student engagement when they see how easy it is to trick the eye! But then I had this crew of kids ask me, "When are we going to get to do those big sculptures like they did last year??!" From day 1, they were begging to do sculptures, and so I caved in and started hounding the lunchladies to save me cardboard. Students looked at the work of Claes Oldenburg and Robert Indiana for inspiration, and after demonstrating how to construct forms in cardboard I let them choose an everyday object they would like to reproduce. Many of them went for a trompe l'oeil effect by keeping the scale consistent to real life, but others went more extreme in scale. The attention to detail on some of these was incredible- the toast in the toaster above is removable, and the chair below looks so much like my original purple rolling desk chair that visitors to my room tried to sit in it!! As an extension on this project, once the sculptures were complete I had my students consider how context changes meaning. They took their sculptures around school to set up situations to photograph. For example, the giant toothpaste tube was photographed in the bathroom sink with yarn "toothpaste" spilling out of it, and the giant diamond ring was used in photos with students posing for a fake proposal. The problem with papier mache is how long it takes to complete a project, but it was worth doing it again this year to see my students excited to build and play with context. We look at a lot of Andy Warhol when we talk about Pop art, and his work and process helps us flow into Photorealism and the use of technology to help make art. We do a grid enlargement focusing on values to show how Chuck Close works, and talk about pixels. Then students took selfies, which we manipulated in Photoshop to posterize and isolate the value layers. 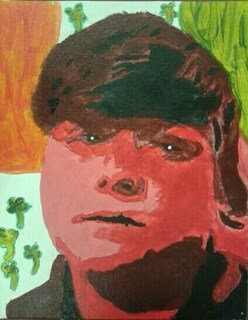 Students used their posterized selfie as a reference to paint their monochrome self-portrait, where instead of drawing values they had to mix paint values. Then they created a background to reflect aspects of their identity or personality, choosing to paint, draw, or collage around their portrait. After exploring identity in self-portraiture, we turned to focus on beliefs and how art is used in activism and to persuade viewers to see the artist's point of view. We looked at artists like Francisco Mora who worked at Taller de Grafica Popular in Mexico doing woodcuts, and talked about why artists use printmaking to spread messages very quickly (the original "social media"!). Students brainstormed ideas around a few activism areas such as human rights, animal rights, and environmentalism. 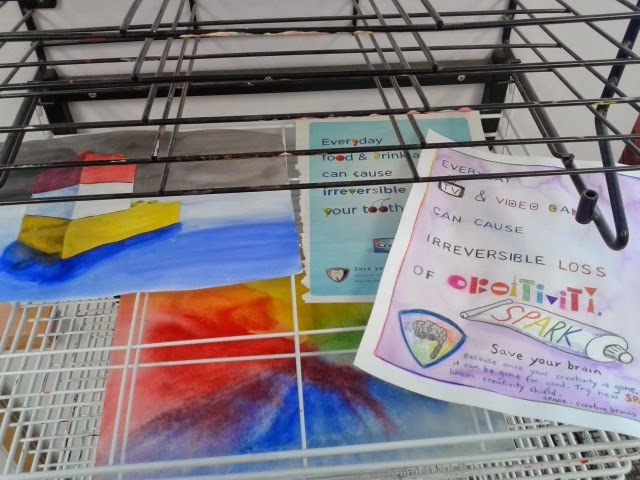 It warmed my heart to see that some of my students decided to explore LGBQT rights, Mental Health, and Civil rights in this project as well, which told me that they felt safe in the art room to explore the things they cared about beyond the simple parameters I had set out. We had very interesting conversations about how to compose positive messages that would make people think rather than make people turn away or react in anger. 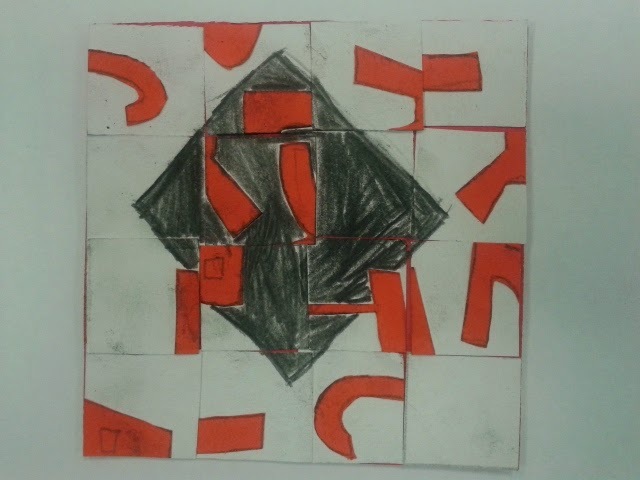 I allowed students to work on their own to make a small piece or work in groups to make a larger piece (haha- they thought teams would be easier, when really it was harder!!). I demonstrated how to carve and gave demos on some different ways to ink for multiple colors. Finally we created displays grouping the works by activism themes. I hope this project gave my 8th graders a taste of activism and a seed of compassion that may grow as they become adult citizens of our society. 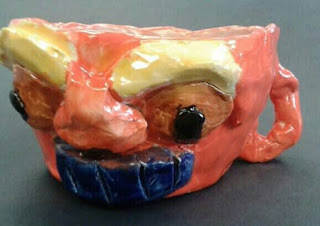 Our final project of the year ended up being clay. Note to self- DO CLAY EARLIER IN THE YEAR!!!!!!!! My 8th graders finish school an entire week earlier than everyone else, and the week before that they have all kinds of rehearsals for graduation and trips. Suffice it to say, trying to squeeze clay in at the end was madness. But oh, what beautiful work came out of it!!!! I asked students to research an artist that they liked to use as inspiration for a lidded clay box. Of course- there were about 10 Starry Nights..... (Really kids? After all the awesome art I showed you over the past 4 years?) 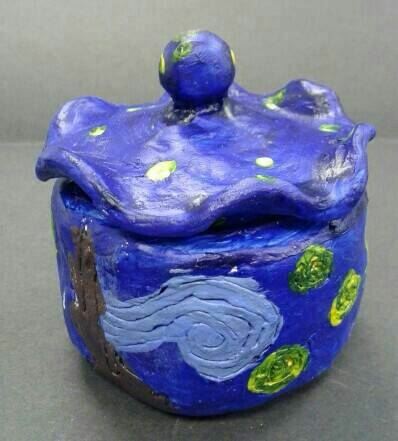 I made all my Starry Night kids make sure their final project looked different from each others' at least! I demonstrated making a pinch pot vessel form and a slab constructed box form as well as some different approaches for making lids. 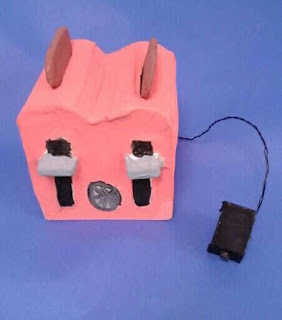 I showed them various artists from the clay studio who had made boxes that seemed to have been inspired by other art, and we talked about what it means to be inspired by something versus copying something. The wide variety of forms, lid techniques, and decorative elements, both sculptural and painterly, was truly impressive. I am very proud of what my 8th graders accomplished this year, and I hope they carry forward with them a love of art, an awareness of culture and media, a critical eye, and a unique voice. I have a feeling they are going to do great things! I'm going to leave this here to mark my past year with 7th grade. The curriculum is supposed to cover the art historical movements of the Baroque period, Romanticism, Neo-Classical, Realism, Impressionism, Cubism, and Surrealism. This year in 7th grade it was hard to judge which projects were successful or not because it was such a challenging group behaviorally. But looking back to when I had this group as 4th graders, 5th graders, and 6th graders they have consistently challenged my management skills. I wish I could pull a handful of them for a real art class, though. Because for all the challenging antics of their peers, I have a few incredibly talented students in this cohort who take what I have to offer and run with it in their own uniquely creative ways. "Can I...(try this alternative way of doing something)?" I hear once in a while. Yes. Yes, you can. Go be an artist! I really love our 6th grade curriculum because it seems the most cohesive. 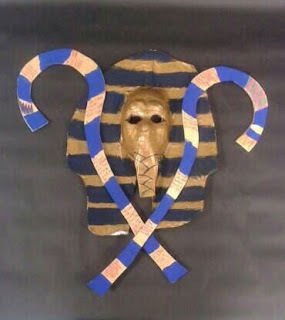 It ties directly in with what students are learning in 6th grade social studies at our school- exploring ancient civilizations and the meaning of culture. There are very clear essential questions: What is culture? How do different people in different times and places express their beliefs and traditions? How do cultures influence each other and change over time? Since 11 and 12 year olds are opening up their awareness of their own place within culture, these themes can also help them define identity, critique popular culture, and better understand others. It excites me that art can be the place where so many ideas and experiences integrate. All that said, some projects were better than others and there are definitely changes I would like to make for next year. Prehistoric art: Students took a virtual tour of the Caves of Lascaux. They considered several possible purposes for why these ancient tribes would have drawn animals and handprints on the cave walls: perhaps to document their experiences of daily life, perhaps as magical thinking to summon the prey they desired to hunt, perhaps to show gratitude to the spirits of the animals they had killed. After painting a textured cave wall- with thought to what rocks and minerals look like (hello science connection!) Students imagined a story they would like to tell about themselves and their experiences and drew in charcoal and pastel over their paper. The one above depicts a dance competition my student won. We also made a class mural of handprints to represent our "tribe". I like using this as a way for the newly-formed classes of students to begin connecting as a team. Sumerian statues: Next we studied the Mesopotamian River Valley, the development of laws (Hammurabi's code), cuneiform as a writing system, ziggurats as public buildings, and votive figures used in tombs to give offerings. This really lays the foundation of what we focus on all year. I showed my students how to work with clay, and they had a choice to make a signature cylinder seal, a cuneiform tablet, or a votive figure showing their "gifts". 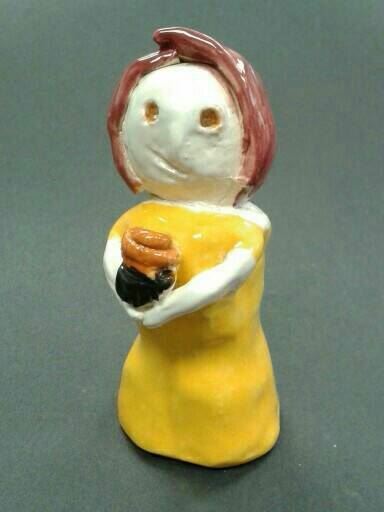 The student above made her figure hold a cupcake to show off her baking talent. I enjoyed seeing how each student decided what path to take for the project, and hope to continue doing options like this for every unit next year. Egyptian sculptures: After finding out what students already knew about Egypt (a lot! ), we further explored ideas about the pharoahs, the pyramids, and hieroglyphics using a Scholastic Art magazine on Egypt. I had students vote on which topic they were most interested in, and formed groups according to interest. Each group did further research on their topic and formed a plan of how they would create something together showing what they had learned. 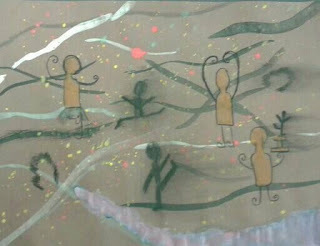 We then used papier mache and some plaster to create large-scale sculptures. I had reproductions of the sphinx, Tutankhamen's death mask, standing pharoah sculptures, tomb offerings, tomb paintings,and sarcophagi. It was a very long project because working in groups is always a challenge. However, student interest was extremely high because they were focused on the thing they were most interested in and working with people they liked. My students were so proud of what they had made, they "borrowed" their projects from the hallway displays I'd made to use in their Egypt presentations in social studies class, too. 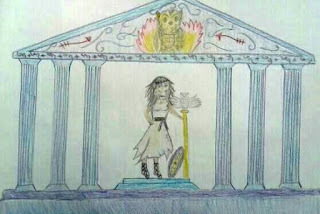 Greek architecture and mythology: For this project my students had to do some homework. They each had to select a Greek god or goddess to research and bring in a picture example and a paragraph story about their myth. We learned about the Parthenon and the various orders of Greek architecture. I showed how to use the rulers to plan a temple structure that included a stylobate (stairs/foundation), columns, entablature, and pediment. Then they had to draw their chosen god or goddess as a statue inside the temple and add symbols and details in the pediment to help symbolize who it was. We know the image above represents Athena, goddess of wisdom and war because of the owl and shield and arrows. Byzantine mosaic: Next we explored the Roman empire, the introduction of Christianity and the split into Eastern and Western empires. We learned about icons and iconoclasts, and the use of mosaics in Byzantine churches. We had a debate about whether it was better to be an iconophile or an iconoclast, which was surprisingly heated! 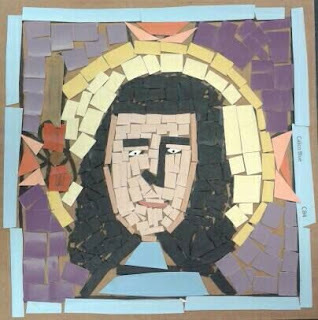 Then students chose to design a mosaic that was an icon, honoring someone they admired, or iconoclast, showing a symbol or pattern instead of a figure. 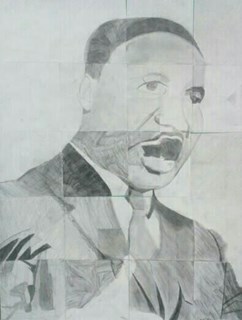 I had done this project as a group collaboration last year, but was displeased with how long it took and how difficult it was to get the students to collaborate.This year I cut 6x6 inch cardboard for each child to make an individual piece, but it STILL took forever to complete, and in the end was voted as the students' least favorite project. I'll have to figure something else out next year. 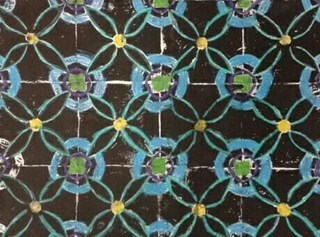 Islamic tile design: We learned about the spread of Islam throughout the Middle East and Mediterranean, and looked at examples of Islamic architecture and design like the Alhambra, the Blue Mosque, and the Dome of the Rock. We also viewed a video on how tiles are made in Iznik, Turkey today for inspiration. Students designed a pattern unit using geometric and nature-inspired shapes to carve into foam plates, then printed their design in a repeating pattern across a 9x12 page. 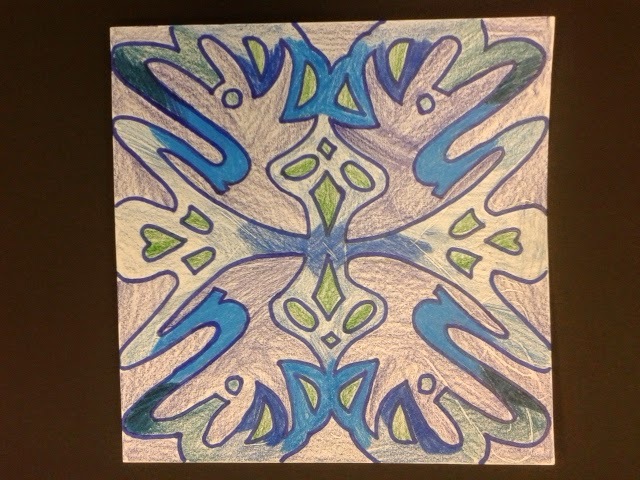 When complete, they colored details, considering symmetry and repetition. This is one of my favorite projects all year! I love printmaking and I love repeating patterns in my own artwork, and this is one of those projects where everybody's art looks amazing all displayed together. 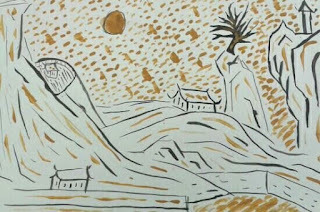 Kano ink and gold: Last year at the Philadelphia Museum of Art was a gorgeous exhibition of Japanese art by the Kano dynasty of artists. I bought the postcard set, which had many scenes of animals in landscapes all drawn in ink with gold backgrounds. I also found a great video on Khan academy that explained how the shoguns wished to show off their power and wealth through paintings of dragons and tigers on screens and doors in their palaces. 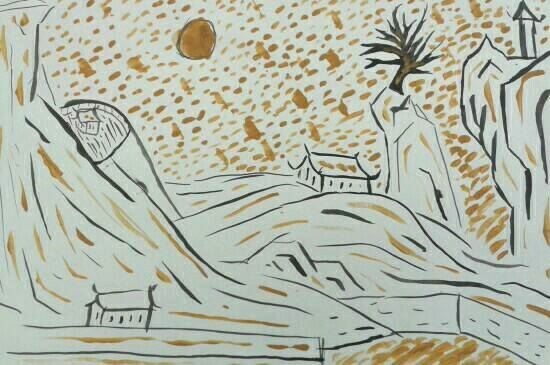 I let students select an image of their choice to work from and experiment with painting directly with india ink. Some wanted to sketch first in pencil, but I banned the pencils and erasers for this one so as not to lose the freshness of the painted lines. We spent a class period just painting in ink, then a second one to add color details and gold backgrounds. This is another project I really love, for the diversity of images that result and the energy of the lines. 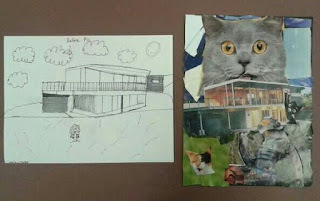 I know many art teachers frown on copying, but the students focus so intently on reproducing their postcard on a larger scale and working from images increases their visual vocabulary beyond the hearts and flowers they constantly doodle. Navajo weaving: Our final culture study is the Navajo tradition of weaving. We look at how their weavings changed over time as they came in contact with other cultures like the Pueblo, the Spanish, and the American settlers. There's also a Philadelphia connection as later designs utilized yarns spun and dyed in Germantown and traded out West. I taught my 6th graders how to warp a cardboard loom and do 3 different tapestry weaving techniques. When complete they chose whether to finish it off as a bookmark, a bracelet, a pouch, or a headband, and we talked about how some art is functional. Instead of tying knots, this year I ran each weaving through my sewing machine to zigzag the ends from unraveling. It took less time than tying all those knots and looked better too! I have a few students in 6th grade who are also in fashion design club after school, and they helped their classmates sew on the machines, too. I have no pictures of our final project due to time constraints, but we reviewed all the reasons why ancient peoples made art. 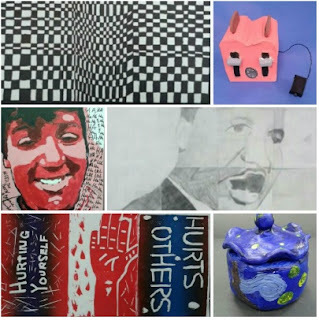 Then I offered a variety of materials, and had students select their own purpose or intention for creating a work of art that would represent their culture. There were several flags (US, Mexican, Italian, Canadian, and El Salvadorian), many sports-related projects, many dance and music inspired pieces, and lots of telephones an video game references. I have to admire teachers who are full TAB/choice based classrooms. It is not easy to manage 25 children in the art room doing so many different ideas and materials. I want to create opportunities for choice in my curriculum because student engagement is dramatically higher when they are doing things they are interested in doing. On the flip side, I find our projects taking longer because my students don't seem accustomed to making decisions and plans for themselves. It's much harder for them. However, the more we do this, the better they should get at it. I believe the curriculum I've developed spirals and scaffolds to encourage students to have a strong concept of the purpose of art in culture and a strong understanding of art history. Unfortunately, what is lacking in my 6th grade curriculum right now is observational drawing skills, and that's something I hope to improve upon in the future. My Blue Art Room has had quite a hiatus! 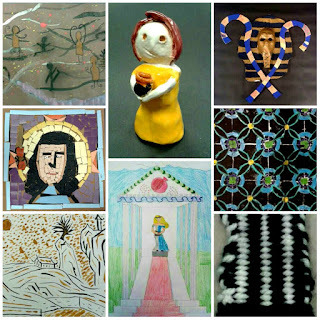 When last I blogged here I was just starting my 3rd year of teaching and beginning a new position of middle school art teacher. Now, here I am finishing my 4th year of teaching and 2nd in middle school. I'd like to get back into the habit of reflection and sharing here. Technology changes and social media changes, and I've spent much more time interacting with other art teachers on Facebook than doing the long, slow practice of writing about my work. The end of the school year is when I pass out the portfolio of work back to students and ask them what was their best piece and worst piece. It gives me an idea of which projects are worth doing again or not. My school's art curriculum is structured strongly around art history, and I try to connect with contemporary art and artists whenever possible. I've also tried to develop lessons for my middle schoolers that will have a significant level of choice and individual expression. My museum: Our 5th graders were lucky to have the chance to visit the Barnes Foundation at the beginning of the school year. To prepare them for their trip we learned about Barnes'symmetrical ensembles, the job of a curator, and the different genre of art. They arranged their own museum galleries using printouts of some of the images from the Barnes collection, and drawing a 1 pt perspective room with museum details like lighting, signs, visitors, and guards. When complete, they critiqued them by deciding which museum they would most want to visit and why. Hex signs: Taking one last inspiration from the Barnes, we explored hex signs. When Barnes couldn't import art from abroad during WWII he turned to local handicrafts for his collection. Since our state standards require us to introduce PA art and artists, this hex sign project was perfect. These symbols are found all over Southeastern Pennsylvania on the barns of PA Dutch farmers. My students were eager to share their experiences seeing them on trips out into Lancaster county. 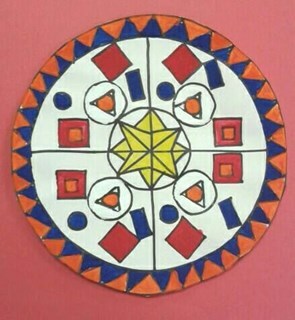 We were also able to learn radial design, geometric shapes, and color symbolism. 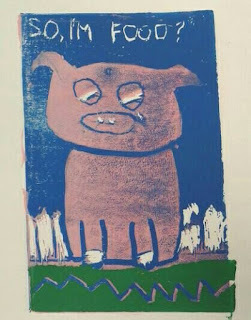 Self-portrait monoprints: This is one of my favorite projects in 5th grade, because printmaking is so much fun. 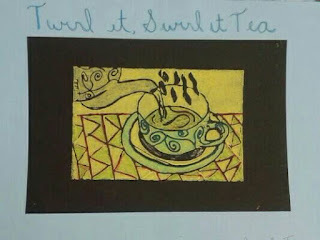 We combined monoprinting (markers on plexiglass laid over photo printouts, traced, and printed)and texture rubbings for the backgrounds) We talk about emotional color and mood. Some students enjoy utilizing more than one of their prints to express different sides of their personality. Still-life relief prints: our printmaking adventure continued with foam relief prints. I let students choose to draw their own object or use a magazine image for inspiration. They carved their foam and printed. Those who were ambitious carved for a reduction print or cut out part of the foam for a puzzle block color effect. I liked how the process allowed for differentiation. It was simple enough for my lower students with levels of progressive difficulty for my higher students. 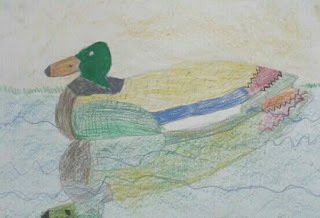 Some chose to alter their prints by coloring them with colored pencils as well. National Parks landscape stamp design: I've done similar versions of this project before. Sometimes it's famous landmarks, or state symbols. In honor of the anniversary of the National Park system this year, I assigned each student a different National Park to research. We went to the computer lab and researched images of the landscape, the animals, and the plant life to use in a stamp design. This was an opportunity to connect with science and ecology, as well as with social studies and geography. One class did this project as a watercolor pencil painting, and another did it as a photoshop collage. The digital versions were much more successful and related with the concept of design. Face jugs: I found an excellent video on PBS History detectives on Edgemont, SC pottery to introduce my students to the tradition of face jugs. I also shared a video read-along of the story of Dave the Potter. Our face jug project even tied back into the Barnes collection and his African Masks. (I love it when I can tie together all sorts of connections in a project!!!) I taught my students to make a pinch-pot base and coiled body for a simple pot, then scoring, slipping, smoothing clay to attach the features. This is the first time in K-8 our students get to work with real clay, since there is no kiln in our elementary building. When complete we used our jugs for a cereal or OJ breakfast and talked about what forms are better for which purpose. 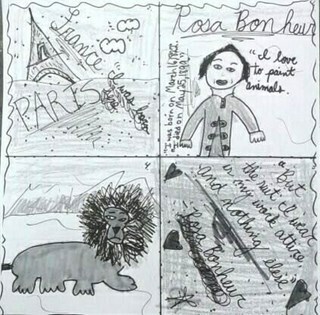 Art History Zine: I don't get to see my 5th graders during PSSA testing due to rescheduling, so while they were with my sub I assigned each student an artist throughout at history to research. They had to find an image, 3 biographical facts, and a quote. I tried to select a range of women and men of a variety of cultures fora diverse selection. Students then drew a comic book-like bio page using their research for reference. Once I got them back I photocopied each student's page, and had them choose up to 5 pages they would like to use to make a small zine. They origami-folded each pamphlet and glued them together into a book with covers. They made a title page and book review on the covers, as a final touch. I also sent home permission slips to see if my students could have their work donated to our local zine library- the Soapbox. I created one big 20 page zine using the images they drew to donate. I liked how this project involved research, cartooning, book arts, and public art ideas. My Philadelphia Story: My students were invited to participate in a public art project that will be installed at the Philadelphia International Airport. I visited the studios of Matthew Alden Price and Won Kyoung Lee to learn more about it. Then had my students draw pictures and bring objects to donate that reflected their experience of the city of Philadelphia. The Phillies, The Eagles, the Mummers, softball, skateboarding, bike life, and dance are the things my students love the best about their city. My favorite genre: to conclude our study of various genre of art and techniques this year,I challenged my students to select what type of picture they preferred (portrait, still life, landscape, narrative, abstract, or public) and the 2D medium they preferred (pencil, marker, paint, pastel) to create a final personal work of art. 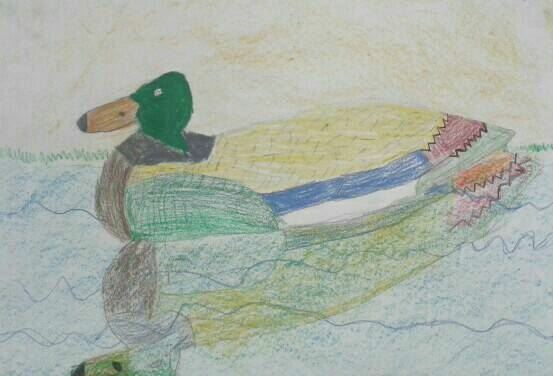 This one started as a still-life of a duck decoy, but then he added the pond and reflection around it. I was so proud of my students and their engagement in this final project. Many reported this as being their favorite project because they really felt like artists making decisions. I'm pleased with how the 5th grade curriculum has developed. I understand the big picture and purpose of how the projects to together and use an essential question to drive the learning. I believe we will continue to work with these themes next year. I would like to do more observational drawing practice with next year's 5th graders to bridge the awkward middle school belief in drawing ability. They don't THINK they know how to draw. They need more opportunities to try. I've shared 10 of the 13 projects we did together in 5th grade this year. Two years ago I lamented how little work we'd accomplished in one year. In comparison, this year 5th grade art was a brilliant success! 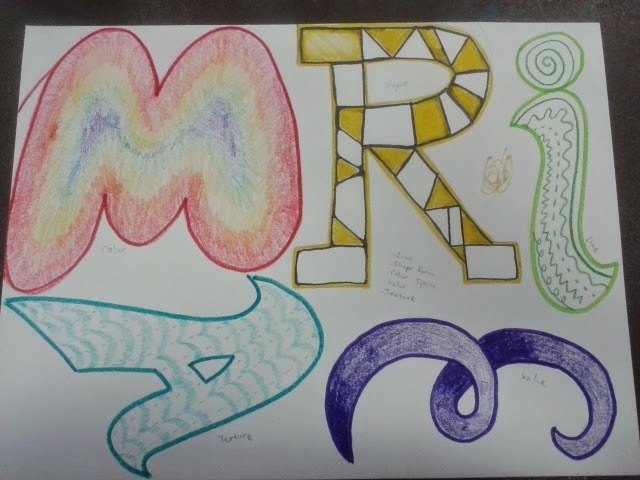 Sixth graders completed their radial name designs with analogous color schemes. The had to design a square, flip and trace it four times, outline the pencil lines in sharpie and color with analogous color scheme. Most of them came out AMAZING, and the kids were excited with the results. 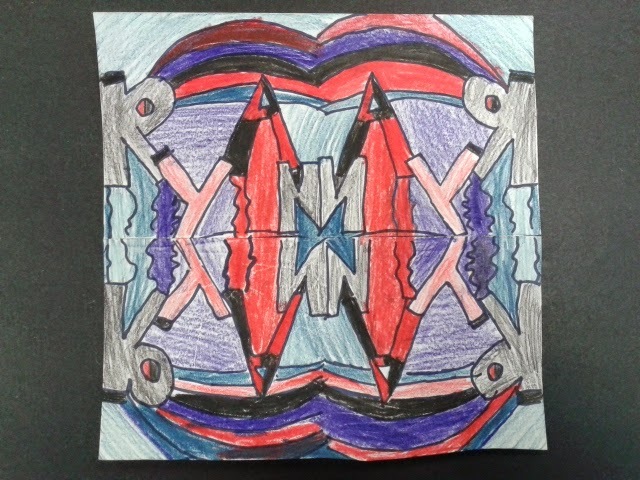 I wanted to show this one because it had a moment of problem-solving.. the student messed up his radial symmetry on the tracing stage and figured out how to cut it apart, rearrange, and reattach the quadrants to achieve radial symmetry. 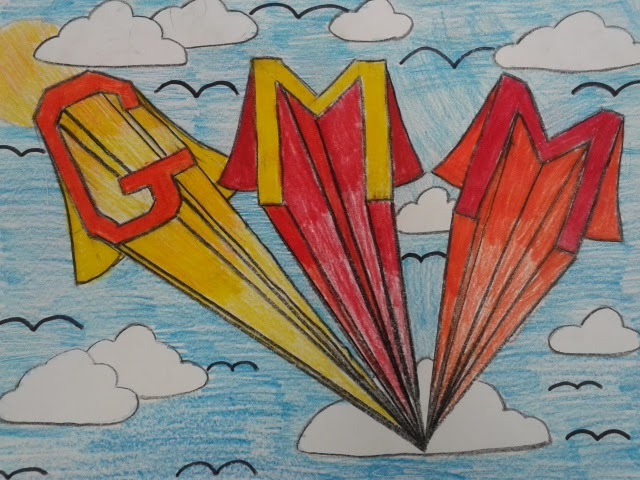 My seventh graders made their names pop out in one point perspective, shading the perspective lines for atmospheric perspective, and added backgrounds to increase the sense of space. I loved how James, above, put his name in a wrestling ring. 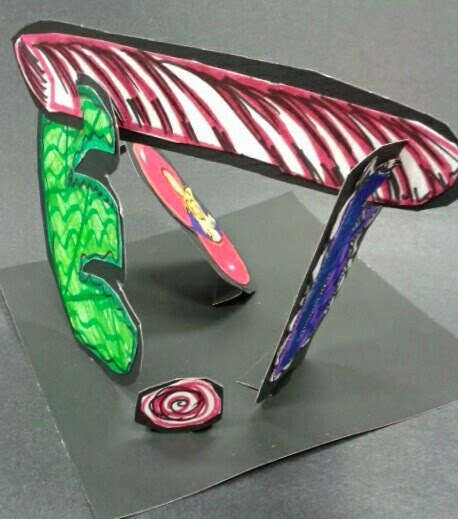 My eighth graders used Alexander Calder as inspiration for a name sculpture. 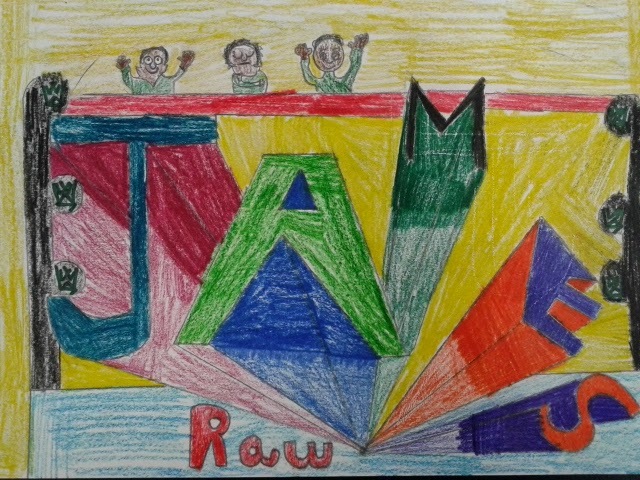 They had to illustrate each element of art in their letters, than use hinges and slots to connect their pieces into a 3-dimensional work of art. Making the letters was excruciating.. some thought it was boring, others went over-the-top in their craftsmanship and took forever. But once they got to the sculptural stage they got way more into it and thought it turned out to be a really interesting project. 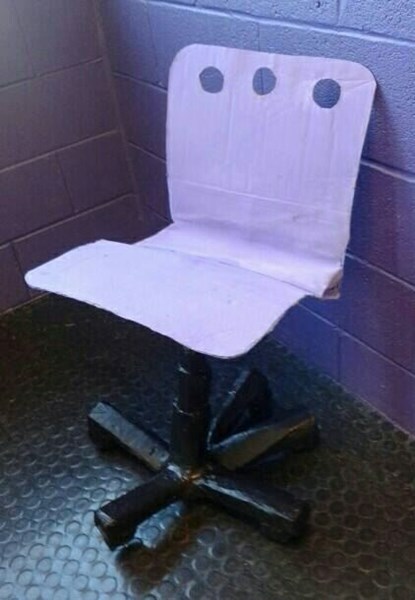 They are all over the school now, and we've gotten lots of compliments. My kids are settling into our routines and I've made some good connections- especially with my 8th graders (oh, I was so worried....). If the rest of the year goes this well I will be one blissful art teacher! I am so happy in my new position. I have ENOUGH planning time to ACTUALLY DO MY JOB. This is huge, because in past years I had very little prep time and was staying after school for at least an hour or more every day to catch up on grading, photographing work for artsonia, and hanging work in the halls. I've even, for the most part, had enough time to write my lesson plans while at school instead of bringing them home over the weekend. I'm happy and my family is happy because they actually get to see me and I'm not super stressed out all the time. Middle Schoolers are funnyyyyyyyy. I love my kids and their questions and stories and jokes, and generally behavior has been pretty good. I've only given one demerit so far, and had to yell only 2-3 times. I haven't cried out of frustration or exhaustion. I've laughed a lot and worked through some difficult behaviors with a good sense of humor. Also in middle school, I can expect them to do a lot more with writing, vocabulary, and image analysis. We've got a routine going called "Quiet 5", where they come in, get their sketchbooks, and immediately get started on a quick warm-up activity. It's really helped with behavior and learning concepts. Just hearing me say something does not instill it in their brains. But writing things down, and drawing examples is working, and I can tell because of the quality of their written reflections at the end of projects. 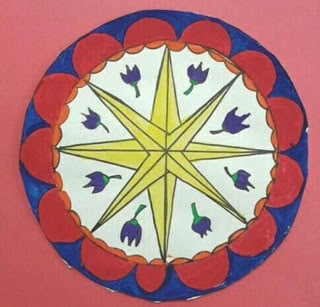 My 6th graders learned about radial symmetry and created these name mandalas. They first drew their name to fill a tissue paper square, then repeated it in all 4 corners. 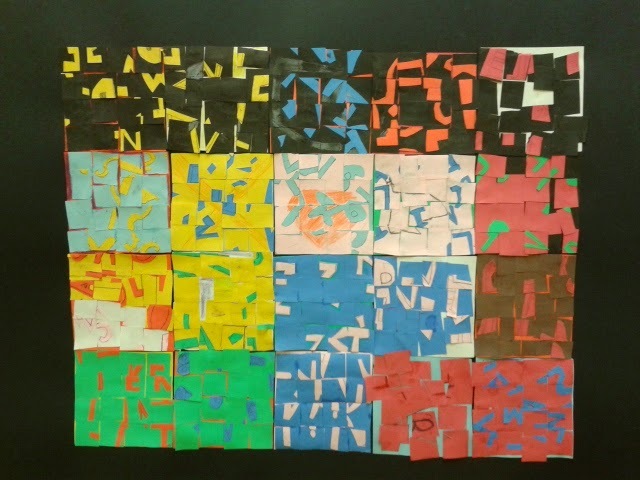 They also learned about analogous colors and selected a limited palette for their designs. I have them arranged in the hall to flow through the colorwheel. 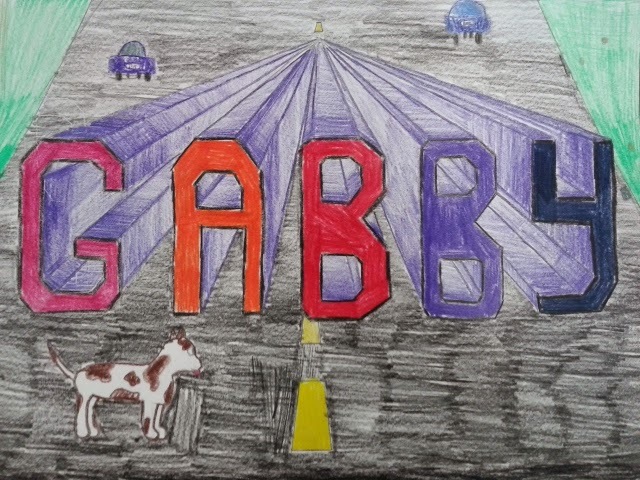 I haven't photographed any 7th grade projects yet, but we're doing 1 point perspective with their names. 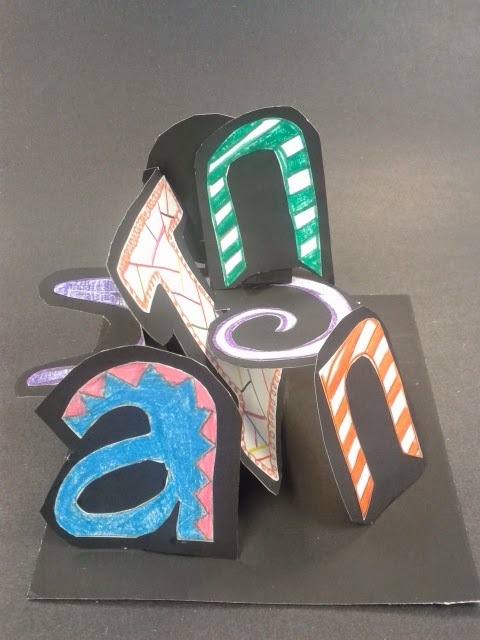 And 8th grade is reviewing the elements of art and using the letters of their names in a Calder-inspired stabile sculpture. Here's a glimpse of what's coming down the pipeline: 5th grade colorwheel paintings, the grade 2 -pt perspective lego paintings, and 8th grade fake advertisements. Did I mention I actually have time to do things like make new exemplars?!! And my favorite part is when my 8th grade portfolio prep group comes to visit me at lunchtime twice a week! 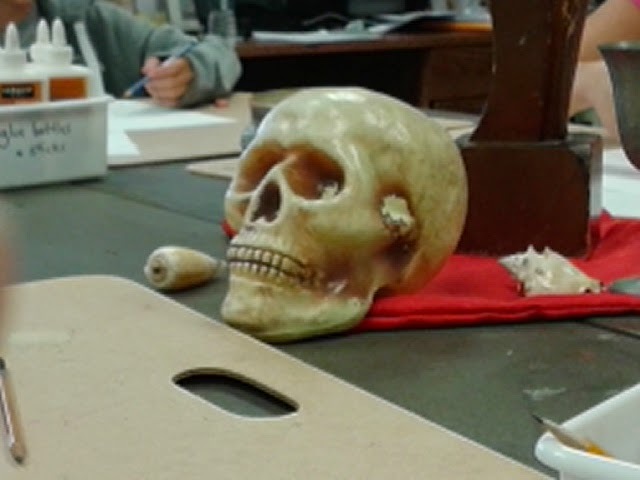 We are currently doing pencil drawings of still-life objects. This crew is planning on applying to the Creative and Performing Arts High School which requires a portfolio audition, and I'm trying to give them time to prepare. They have to be done by December, which will be here before we know it. 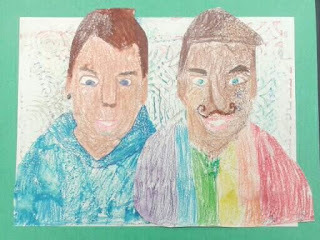 This blog started off sharing a glimpse into what goes on inside my blue art room at Christopher Columbus Charter School North, a K-5 elementary charter school in Philadelphia, Pennsylvania. After 2 years with K-5 I've moved up to our upper school to teach 5-8! It's now technically a lavender art room.... but please follow along with my current adventure as a middle school visual art educator! 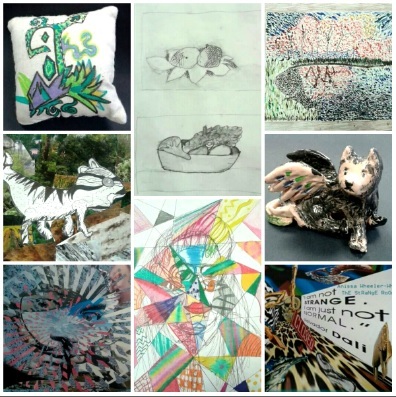 This blog has been created in a spirit of sharing process and learning with the wider art education community, but please respect my ideas and the work of my students. 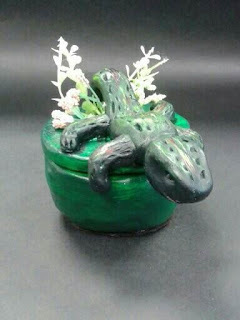 See our gallery on Artsonia!